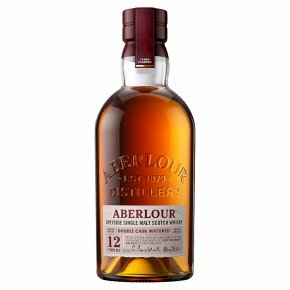 Aberlour 12 Year Old is an award-winning single malt scotch whisky. This elegant yet complex malt, suitable for all occasions, has been matured in two cask types - Traditional oak and Sherry oak casks. Specially selected every year, they are filled with whisky and quietly aged for a minimum of twelve years; then the casks are married together. Traditional oak casks encourage the subtle character of Aberlour to develop, whilst Sherry oak casks add hints of ruby gold colour and a deep and rich flavour to the whisky. A perfectly balanced single malt whisky with notes of fruits and spices. Sold in its signature box, it is the perfect gift for any occasion. Serving suggestion: Enjoy straight, neat or on the rocks.